Bao Phi: Speaking out and speaking the word. Bao Phi, a spoken word poet and community activist, was previously featured in diaCRITICS. Here, Valerie Soe, from her blog Beyond Asiaphilia, reviews Bao Phi’s most recent performance at SFSU and looks into how he speaks out about injustice and works for justice. And head’s up for those in Southern California. 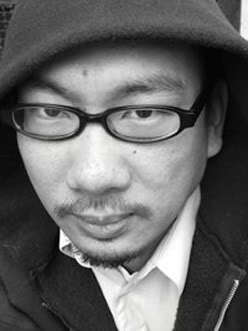 Bao Phi will be speaking at USC’s State of the Word: Spoken Word by Asian American Artists, Saturday, April 2, 2011. Last week I had the pleasure and privilege of witnessing the phenomenal spoken word artist Bao Phi reading at my homebase, San Francisco State, and his singular blend of brilliant wordsmithing and sharp political commentary was completely awesome. Bao was the capstone presentation at the two-day long Re-SEAing Southeast Asian American Studies conference, hosted by the Asian American Studies Department at SFSU where I work, and he rocked the house with his funny, smart, sensitive, and deeply moving work. Phi is the author of one of my favorite spoken word pieces, “Reverse Racism,” which I teach in all of my Asian American culture classes, but prior to last week I’d never heard him read in person so I was really looking forward to his presentation. He didn’t disappoint, reading mostly from his ongoing series, The Nguyens, in which he inhabits and articulates the experiences of various Vietnamese American characters surnamed Nguyen, from waitresses to artists to Prince impersonators. 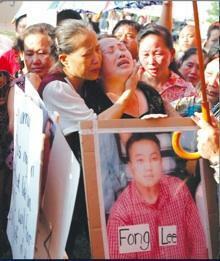 In 2006, Minneapolis Police Officer Jason Andersen shot and killed Fong Lee, a 19-year old Hmong American. Andersen was awarded a Medal of Valor, though the Lee family and community members allege that Fong Lee was unarmed and the gun found on the scene was planted by police. During a foot chase in North Minneapolis, Andersen shot at Lee 9 times, 1 bullet missing, the other 8 hitting Fong Lee as he ran and as he lay dying on the ground. 8 (9) embeds significant parenthetic phrases (gang member for Lee; hero and peace officer for Anderson) to suggest the moral panic evoked by the police department in smearing Lee in court. The poem captures the irony of Hmong Americans who fled persecution in their home country only to find more violence as well as flagrant racism once in the U.S. It also links Lee’s experience with other egregious cases of police brutality, invoking among others Oakland’s Oscar Grant, whose killer, Johannes Mehserle, has already been released from prison after serving just 24 months. Fong Lee’s mother Youa Vang Lee, 2010. Bao Phi has active in the fight to bring Lee’s killer to justice, using his poetry and spoken word pieces as well as numerous blogs posts and articles to illuminate this grave miscarriage of justice. Unfortunately the fight has thus far been a futile one, with the Supreme Court recently declining to review the case, but it has galvanized an outraged Minneapolis Asian American community. Phi has been at the forefront of the struggle, and by using poetry as a means of memorializing the injustices in Lee’s death, his work offers hope for preventing future cases of unchecked police brutality. It’s great to see an artist passionately engaged with important social issues–I’m counting the days to the release of his first book, due out in the fall from Coffeehouse Press. Here and here are a couple nice blog entries by Bao Phi outlining the Fong Lee case and Phi’s involvement in it. As usual the comments section is instructive in itself. With many thanks to Bao Phi, here in its entirety is 8 (9). Community members point out that accusations about Fong Lee’s history and character, specifically allegations that he was in a gang, were allowed in court and written about in the press. But Officer Andersen’s alleged dislike of Asians and history of derogatory remarks against Asians was neither allowed in court nor written about in the press. That he himself would never take. Fong Lee was 19 (gang member). I can imagine him (gang member) and his (gang member) family. They are eating (gang member) something that steams and it does not steam like food from this (gang member) country, the smell lingers (gang member) like home. It is Minnesota so (gang member) the lights inside no matter how dim somehow makes (gang member) all indoor rooms feel warm. Now its summer and he’s fishing with his (gang member) friends. They (gang member) get on bikes and their (gang member) legs drape low, (gang member), arms lazy crosses on the handlebars. Their heads lean as they debate the Minnesota Vikings (gang member) and the Minnesota Twins, slapping absently at the logos (gang member) on their caps and (gang member) shirts. Officer Jason Andersen (hero) shot Hmong American teenager Fong Lee eight times (to serve and protect). A bullet wound in Fong Lee’s hand suggests the teenager may have held his hands up in surrender (decorated officer) as Officer Andersen (white) shot (Medal of Valor) him. Andersen was also charged with domestic assault (peace officer) by his girlfriend though charges were later dropped (officer of the law). Officer Andersen (police officer) was also accused of kicking (hero) an African American teenager who was on the ground in handcuffs in 2008. An all-white jury found Officer Anderson not guilty of using excessive force. I’m wondering when people will care. If we made your story into a movie about killing dolphins, perhaps. I’m 18 and the brutal cold holsters my hands into the warm solace of my jacket pockets. The police officer snaps his hand to his gun. My pockets are empty. My hands open. Still. My story would have ended in smoke and red snow. If my body lay there, perforated, would I bleed through holes in his story? Lost, you turn the car around and see trees stretching up like greenbrown fencing up to the blue skies. For a moment you think that woods stretch forever, somewhere close a bubbling stream whispers white kisses across worn rocks, a deer leans its neck down to drink, the velvet moss of a hushed secret world here in your city. But just beyond the neck of scrub trees is the hint of chain-link, the distant ghost silhouette of strip mall, just one step past the shadows of those leaves are railroad tracks running like stitches over broken glass and gravel. Minnesota Nice: this city hides its scars so well. All our lives, men with guns. Chased by men with guns. Michael Cho. Cau Thi Bich Tran. John T. Williams. Tycel Nelson. Oscar Grant. Fong Lee. Bao Phi has been a performance poet since 1991. A two-time Minnesota Grand Slam champion and a National Poetry Slam finalist, Bao Phi has appeared on HBO Presents Russell Simmons Def Poetry, and a poem of his appeared in the 2006 Best American Poetry anthology. Valerie Soe is a San Francisco filmmaker and artist and her productions include art/film/revolution (2007); Carefully Taught (2002); Picturing Oriental Girls: A (Re) Educational Videotape, (1992, Best Bay Area Short, Golden Gate Awards, San Francisco International Film Festival) and “ALL ORIENTALS LOOK THE SAME,” (1986, Best Foreign Video, Festival Internazionale Cinema Giovani). She has recently screened at the Getty Center’s exhibition California Video and at the New Museum of Art in New York City, and her most recent video, Snapshot: Six Months of the Korean American Male, has screened extensively at film festivals across the country. She is also a professor in San Francisco State University’s Asian American Studies Department. Please take the time to rate this post (above) and share it (below). Ratings for top posts are listed on the sidebar. Sharing (on email, Facebook, etc.) helps spread the word about diaCRITICS. And join the conversation and leave a comment! What did you think of Bao Phi’s 8(9)? How can spoken word poetry voice injustices and call out for justice? I didn’t know he was coming out with a book! Hoorayness. And thanks for posting 8(9) here, and highlighting Fong Lee, and Reverse Racism. Hehe!